Abundance Wimbledon is a project to use up fruit that would otherwise go to waste. 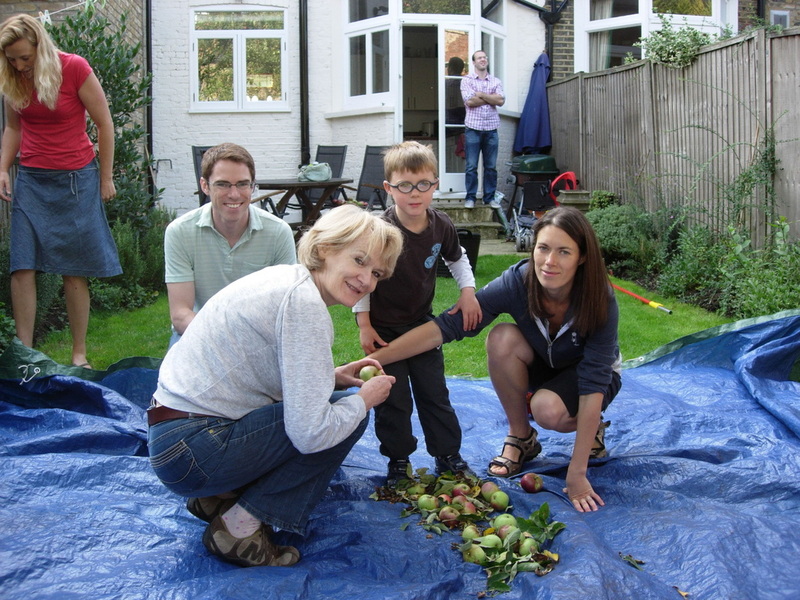 We do this by bringing people together to pick surplus fruit growing in gardens and public spaces in the Wimbledon area. The fruit is shared out for people to eat and make into a wonderful range of jams, chutneys, cakes and sweets. We also pass some of it on to local good causes supporting people struggling to pay for food. People from different backgrounds are happy to work together, to share their skills and ideas, appreciate nature and being in the open air, and enjoy the whole experience of helping out. All sorts of people from Wimbledon, Merton and beyond have helped out, older people have come fruit picking, collected jam jars and made jam, and children have joined in enthusiastically too. We have an event in September to sell produce, showcase what can be done with fruit and to encourage people to look after their fruit trees and make the most of the fruit. The first Abundance group started in Sheffield in 2007 and the idea has spread around the country. Inspired by this, Juliet and Joyce from Transition Town Wimbledon, Daphne from St Mark’s Church, DeNica from Wimbledon Park Residents’ Association and Jo from the John Innes Society Gardening Group got together to start an Abundance project in Wimbledon in 2011. Since then, they have been joined by people from around Wimbledon who just want to see all this fresh fruit being put to good use. Carole, Samantha, Kara, Liz and Gilli as well as many others have made a big contribution to the project and we thank everyone for their help. Abundance Wimbledon is supported by Sustainable Merton, local churches, residents' associations and many other groups around the borough. See groups page. churches, community centres. We sent news releases to residents' associations, 'friends of' groups and the churches so they could include articles about the project in their newsletters ... and told everyone we knew about the project. People are encouraged to join in however they want to - fruit-picking, telling us about a fruit tree, making jam, helping to organise things. All help is welcome, however much or little. Some of us also get together at the Green Coffee networking group (see HERE) which meets monthly and is an opportunity to share ideas and link up with other groups. We start off in July with picking a few cherries and mirabelle plums, then go on to pick plums, damsons, blackberries and lots of apples and pears. Some also find more unusual fruits to gather such as elderberries, rosehips, quinces, rowan berries, medlars and even a few kiwis. Most of the picking is done over August and September - we aim to have teams of people picking on Wednesday mornings and Sunday afternoons. We have a 'feet on the ground' policy for picking fruit - see 'The Fruit Picker's Pledge'. 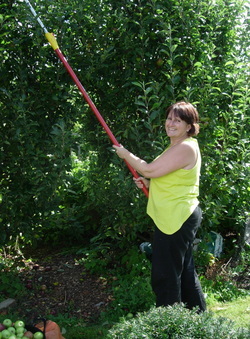 So we use fruit-pickers - basically a long pole with a bag on the end. Or else, we use a large tarpaulin and shake the fruit down. The fruit is then weighed and the owner of the tree and the pickers are offered a share. The rest is given to local charitable groups providing free food to those in need. Any remaining fruit is given to anyone who can use it. The overriding objective is that the fruit gets used! 2011 was our first year and we were lucky that it was an exceptionally early and abundant year for fruit. At a guess, we picked about 1,400 kilos. In contrast, 2012 was an exceptionally poor year for fruit, with months of cold wet weather reducing the crop and many tree producing no fruit at all. We picked around 1200 kilos. There was a long cold spring in 2013, which meant the picking started late and there were no early plums, but it was a good year for redcurrants and quinces. We picked a total of 1360 kilos. 2014 started with a really mild spring. We started picking early, but some of the late season trees failed to produce any fruit. We picked 1640 kilos. 2015 started with a long cold spring. This meant the apples were nearly a month late, but but we had an excellent crop of early plums, lots of pears and, for the first time, apricots! We collected a total of 1806 kilos - another record year! 2016 was different again with a warm winter and a long cold spring. This played havoc with the fruit trees – everything was late and many trees didn’t fruit at all! We were lucky to collect as much as we did - 1538 kilos. WHAT FRUIT WAS PICKED in 2016? We are grateful to around 40 fruit picking volunteers who picked all of this in good weather and in bad. And also to the garden owners who so kindly invited us to come and pick in their gardens. This year we organised the fruit picking a bit differently, with organisers coordinating fruit picking and sharing in local areas - Morden, Raynes Park, Wimbledon Park, Martin Way allotments and Wimbledon Village (instead of it all being done from the centre). The hard work of the local fruit picking organisers meant that we were able to follow up most leads on available fruit and the fruit picked was only a little down on last year and we were able to pass on even more - 386 kilos - to local good causes. Fruit was offered to garden owners, who may not have been able to pick it themselves. 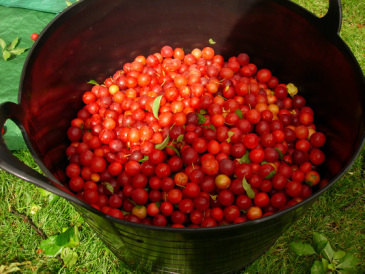 Pickers were also able to take home fruit, to make into jam, put in the freezer, give to neighbours - or whatever. Many tips and recipes were exchanged and new skills learnt with some trial and error. SO WHAT WENT TO GOOD CAUSES? In 2015, we had a total income of £1,339 and expenses of £872 leaving us with an excess of £467. Our Fruit Day income declined slightly this year to £1,234. The higher takings from the fruit press and cakes were not quite enough to offset not having a raffle or Karoline's produce stall. However, the fruit press was lent out more, leading to higher donations from other groups, amounting to £105. Our Fruit Day spending was £49, down on last year as we bought little new equipment and made sandwiches for stallholders, rather than buying them in. We spent £175 on general project expenses,about the same as last year, and this mainly went on insurance and publicity, including a purchase of 2,500 Abundance leaflets (which should last a few years). As we are organising fruit picking at a more local level, we'll probably need more fruit picking poles, tubs and other equipment. This year, we had a total income of £1298 and expenses of £1,200 leaving us with an excess of £98. Our income from Fruit Day was £1273, slightly down on last year (which was boosted by selling a lot of gourmet jam made by Jean-Jacques). We also received £25 in donations as a result of lending out our fruit press and crusher, making a total income of £1298. Again our main spending was on Fruit Day - the hall, a donation to the orchestra, publicity, equipment, sandwiches and the ingredients for making things cost a total of £705. Our other main expenditures were on insurance, fruit picking poles, tubs and publicity. We also gave a donation of £100 to Merton & Morden Guild. We don't anticipate buying any more fruit picking poles this year, but need to buy more leaflets and will look at purchasing a fruit dehydrator. We'll also look to see if we can reduce some of our costs. In 2013, our total income was £1482 and we spent £932, leaving us with £550 to carry over to next year. Most of our income came from Fruit Day on Sept 21st, generating £1399. £740 came from the sale of jams, jellies and chutneys and the rest was from the sale of freshly pressed juice, cakes and plants, the raffle, the pie-making and games. An additional £83 came from hiring out the fruit press, donations and selling plants at another event. Our main spending was on Fruit Day - to pay for publicity, the venue, equipment and various other costs. Other main spending was on insurance, fruit picking equipment and to help pay for 5 fruit trees planted in public spaces. We have sufficient money to fund Abundance next year and are considering what else we might spend money on to further the aims of Abundance. Wakefield for his kind donation. We also had donations from those borrowing the fruit press and lots of people put money in our collection and we are very grateful for all of those. Around £500 was used to pay expenses for 2012 (publicity, venue hire and equipment). The remainder will fund the Abundance project in 2013, as well as provide a small fund to help other local community food projects. We donated two fruit trees to a new community garden run by the Polka Theatre. project. St Marks gave us a very favourable rate for hiring the hall and garden and Kall Kwik did the same for printing leaflets. The Intergenerational Centre in Mitcham let us borrow their fruit press for free. We thank all of these groups, as well as the many others, for helping to get Abundance Wimbledon started. Our Abundance Fruit Day event in 2011 generated over £700 and this was spent on funding our project in 2012. The main spending on equipment was a fruit press and crusher (costing £530) and three more fruit-picking poles, costing £111. The rest of the expenditure was on publicity, hiring the venue and a other equipment. In the week before Fruit Day, the price of fruit in Morrison's was…. So, by picking fruit in Wimbledon, we saved…. The Braeburn apples in Morrisons were from New Zealand - 18,000 miles away. Sourcing the 1,408 kilos of apples in Wimbledon and not New Zealand saved an estimated 175 kilos of CO2 emissions from shipping alone.